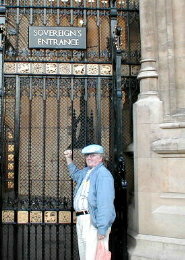 In July of 2000 representatives of Clan Harmon launched an invasion of Merrie Olde England and the commonwealth of Scotland for the purpose of fun, relaxation and education. As to the education, click here to see Tom's experience as a participant in a RoundTable in Oxford. 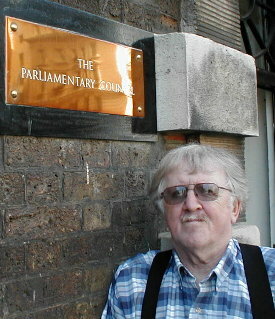 In Scotland there was also the matter of back rent about which more will be said. Here are some small glimpses of what they saw and did. 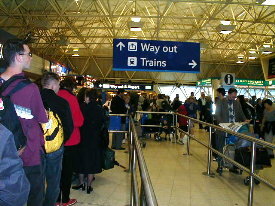 Upon arrival at Gatwick Airport we were advised that trains were "way out." True. 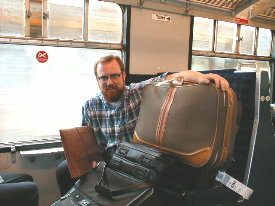 Although the Land had been claimed, Erin guarded the mountain of luggage. 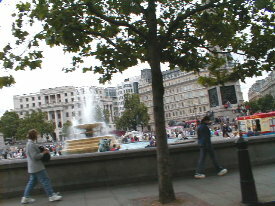 While zipping by in a taxi a hurried shot of Trafalgar Square as though it would run away! "Green Man" established in 1734. 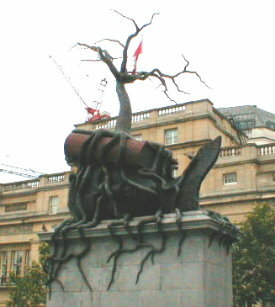 Under the heading of "Strange Objects" observe this disembodied head under a book with a tree growing out of the ear. OM gone amuck? 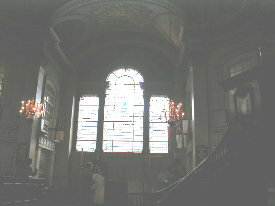 Sunday Morning in the beautiful, dimly lighted church of St. Martin-in-the-Fields. 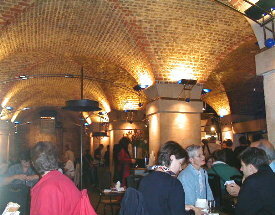 In the basement of this church is a public restaurant known as the "Crypt Cafe." 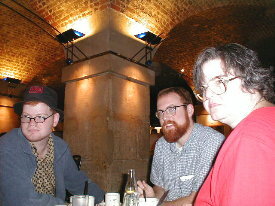 Our intrepid crew, while watching for a young man with a scourge, enjoyed a tasty meal in the crypt. On to Covent Garden. 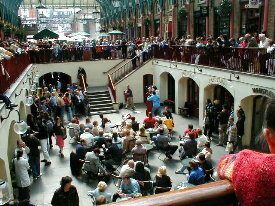 A group of street musicians, playing classical music, worked the crowd very effectively. 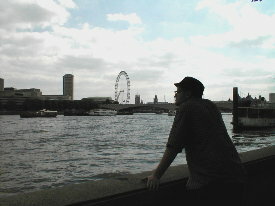 Elliot (not TS) contemplating the River Thames and resting his weary feet. 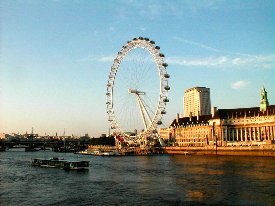 The newly famous "London Eye" the world's largest and busiest ferris wheel is quite impressive. 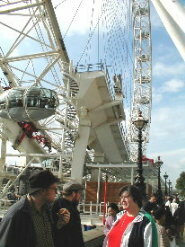 Eyeing the London Eye and deciding that a 2-day wait was too long. 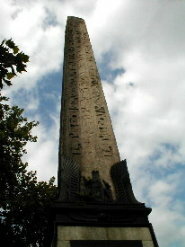 Cleopatra's Obelisk, lay on the bottom of the Thames for many years. 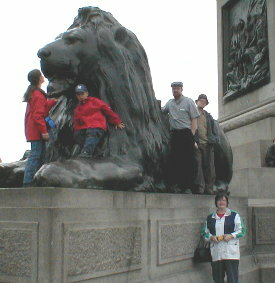 Our travelers considering how nice it would be to rest on the bottom of the Thames. 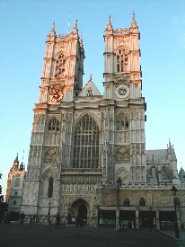 The beautiful Westminster Abbey where kings are crowned and the famous are buried. 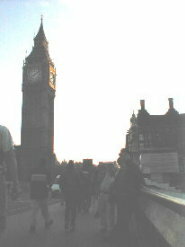 Our intrepid group literally standing in the shadow of the tower containing Big Ben. 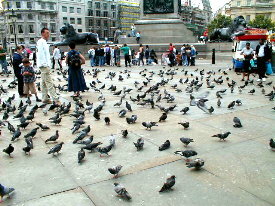 The pigeons at Trafalgar Square are always ready to greet anyone who might have a handout. 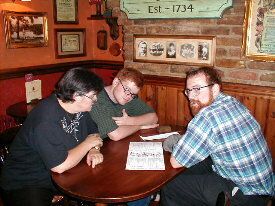 As you may guess, we found the Square to be a central location on the Tube system to begin our daily adventures. 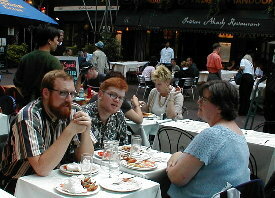 After a several hour stroll through the National Gallery of Art, the Three old Friends decided to have an all-you-could-eat Chinese dinner at a curbside diner. After about 20 minutes, our host decided that was all we could eat! 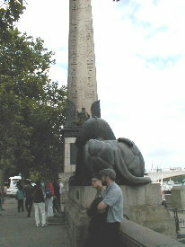 This view is of Commodore Nelson atop his pillar in the center of Trafalgar Square. 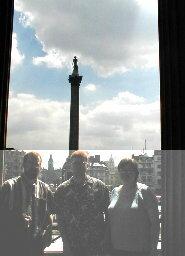 We are standing on the front portico of the National Gallery. The Gallery was featuring experimental works of new artists interpreting old masters. Elliot took the tour and if you email him he will tell you all about it. 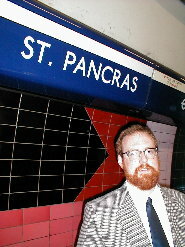 Have we found St. Pancreas? 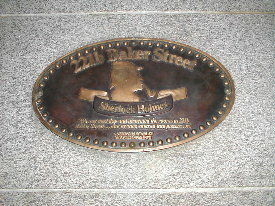 The famous non-existent address of a famous non-existent person. 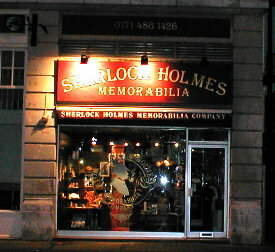 Across the street from the non-existent address is a real curio shop. AND SO WE END ANOTHER DAY. TO SEE DAY3 CLICK HERE. ON TO DAY 5, CLICK HERE.